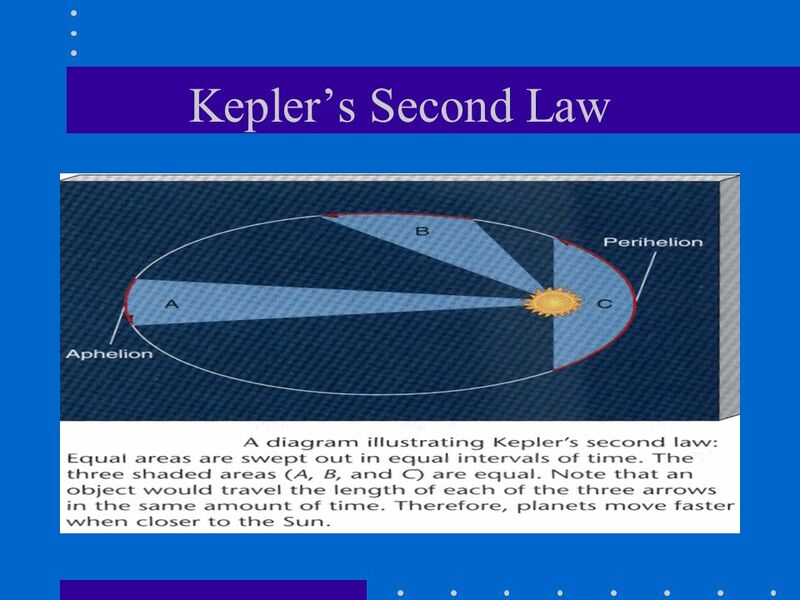 2 KEPLER’S LAWS (1) The path of every planet in its motion about the sun forms an ellipse, with the sun at one focus. (2) The speed of a planet in its orbit varies so that a line joining it with the sun sweeps over equal areas in equal times. 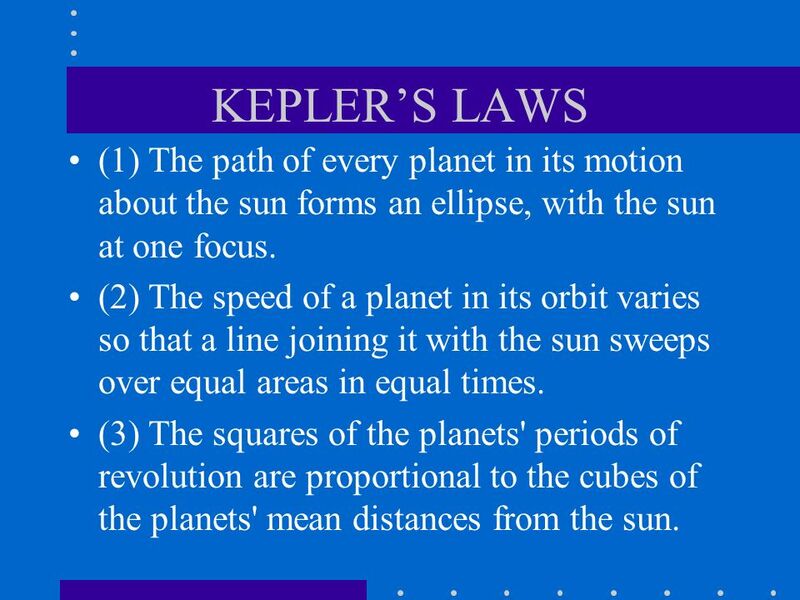 (3) The squares of the planets' periods of revolution are proportional to the cubes of the planets' mean distances from the sun. 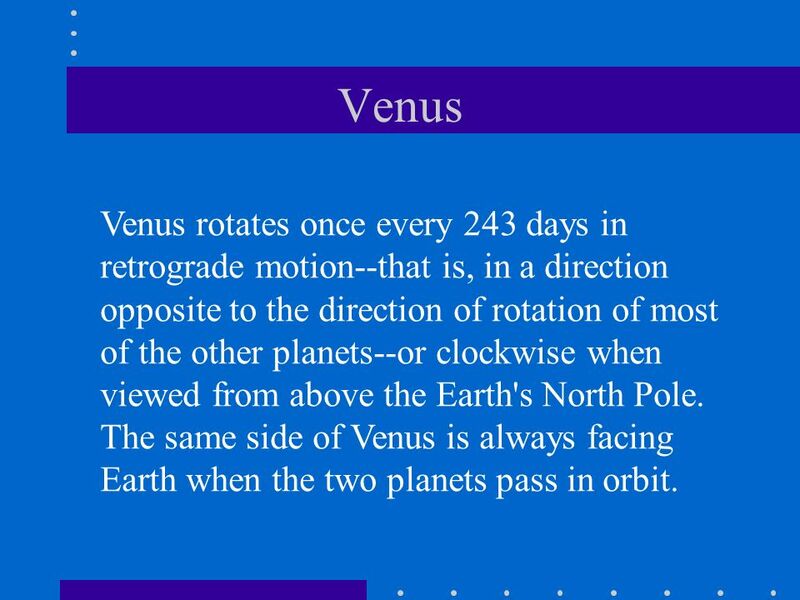 7 Venus Venus rotates once every 243 days in retrograde motion--that is, in a direction opposite to the direction of rotation of most of the other planets--or clockwise when viewed from above the Earth's North Pole. 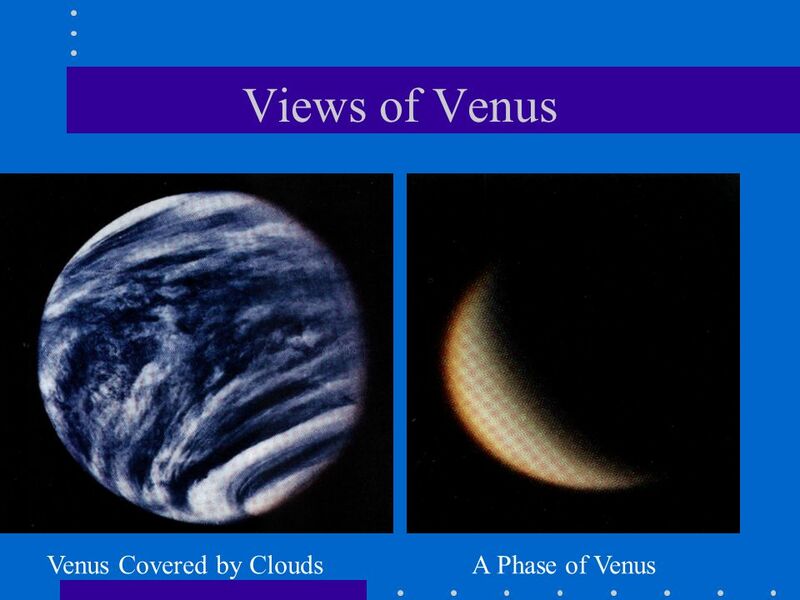 The same side of Venus is always facing Earth when the two planets pass in orbit. 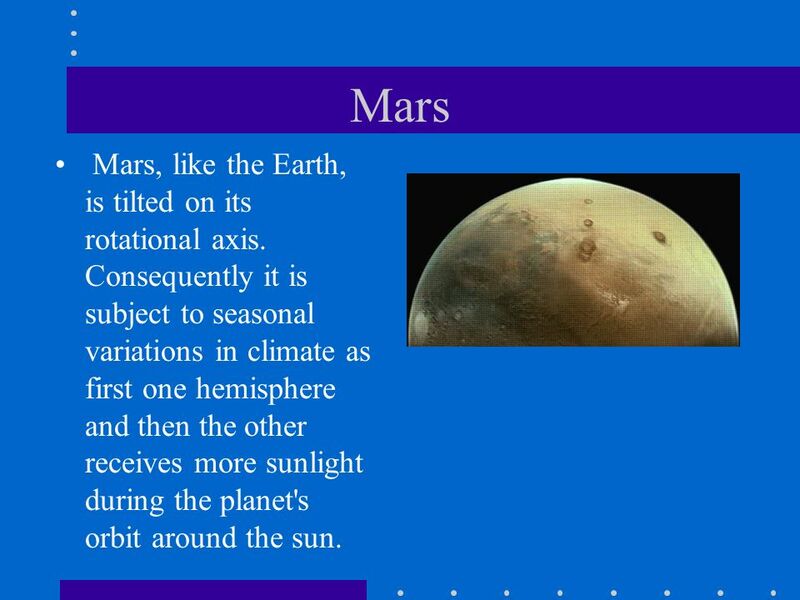 9 Mars Mars, like the Earth, is tilted on its rotational axis. Consequently it is subject to seasonal variations in climate as first one hemisphere and then the other receives more sunlight during the planet's orbit around the sun. 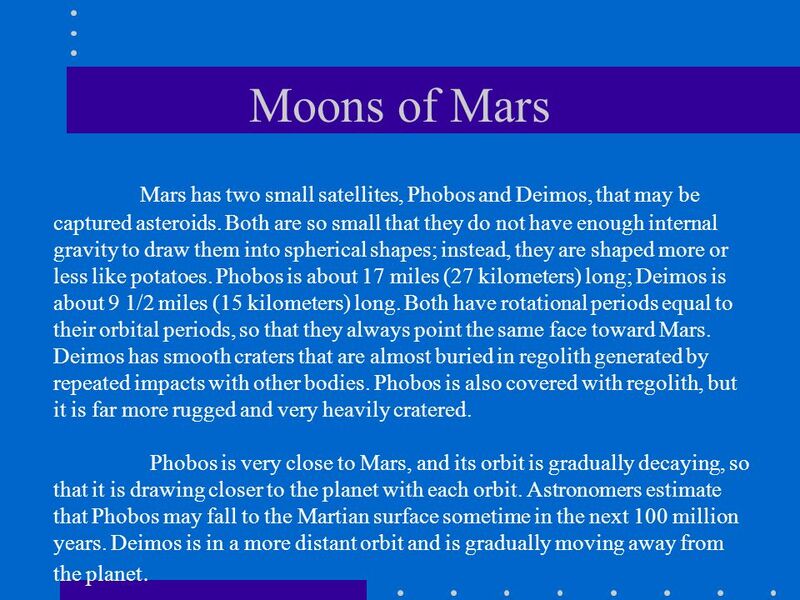 10 Moons of Mars Mars has two small satellites, Phobos and Deimos, that may be captured asteroids. Both are so small that they do not have enough internal gravity to draw them into spherical shapes; instead, they are shaped more or less like potatoes. Phobos is about 17 miles (27 kilometers) long; Deimos is about 9 1/2 miles (15 kilometers) long. Both have rotational periods equal to their orbital periods, so that they always point the same face toward Mars. Deimos has smooth craters that are almost buried in regolith generated by repeated impacts with other bodies. Phobos is also covered with regolith, but it is far more rugged and very heavily cratered. Phobos is very close to Mars, and its orbit is gradually decaying, so that it is drawing closer to the planet with each orbit. Astronomers estimate that Phobos may fall to the Martian surface sometime in the next 100 million years. Deimos is in a more distant orbit and is gradually moving away from the planet. 11 Jupiter Jupiter spins rapidly on its axis, completing one rotation in less than ten hours. Because of the centrifugal force caused by this rapid rotation, Jupiter's diameter is greater at the equator than it is from pole to pole, giving the planet the shape of a slightly flattened sphere. Jupiter and its 16 known satellites may have formed as a miniature solar system--a large rotating gaseous ball surrounded by a planetary nebula that eventually developed into the planet and its satellites. Jupiter has a narrow system of rings, discovered by the Voyager 1 spacecraft in 1979, that are composed of tiny rocks and dust particles. 12 Saturn At least twenty satellites orbit Saturn. The largest of these is Titan, intermediate in size between the planets Mercury and Mars. Titan is half rock and half ice, with an atmosphere of nitrogen and methane that exerts about 1 1/2 times the surface pressure of the Earth's atmosphere. Its surface is very cold and is obscured by haze. It may be covered by oceans of liquid methane. The six other major satellites are Mimas, Enceladus, Tethys, Dione, Rhea, and Iapetus. Most of these have icy, cratered surfaces. Enceladus has a smooth, bright surface of apparently pure ice. Iapetus has a large patch of material as dark as asphalt that nearly covers the leading hemisphere (the side of the satellite facing in the direction of orbital motion). 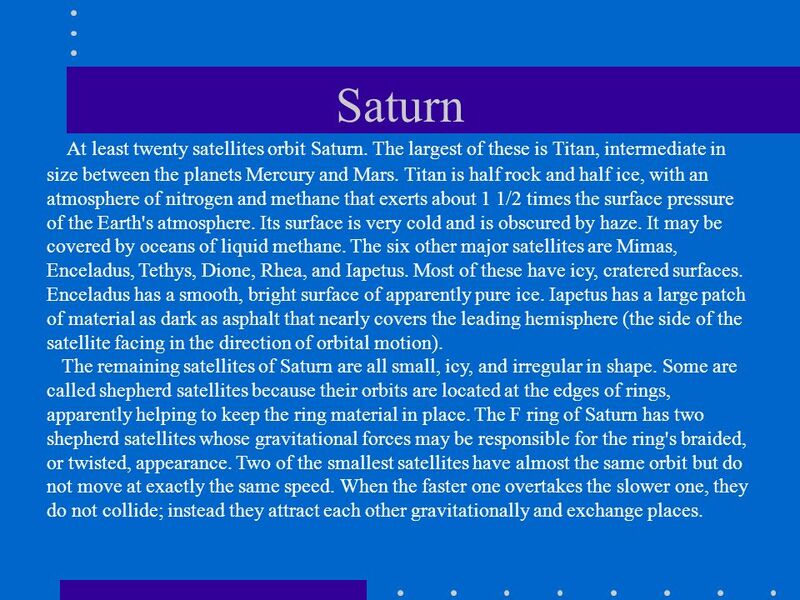 The remaining satellites of Saturn are all small, icy, and irregular in shape. Some are called shepherd satellites because their orbits are located at the edges of rings, apparently helping to keep the ring material in place. The F ring of Saturn has two shepherd satellites whose gravitational forces may be responsible for the ring's braided, or twisted, appearance. Two of the smallest satellites have almost the same orbit but do not move at exactly the same speed. When the faster one overtakes the slower one, they do not collide; instead they attract each other gravitationally and exchange places. 14 Uranus Uranus' rotational axis is tilted an unusually great 98 degrees from a hypothetical line perpendicular to the ecliptic plane. (The ecliptic plane is the theoretical plane created by extending Earth's orbit around the sun to form a vast, flat surface.) Thus the planet lies on its side with its north pole pointing slightly below the plane. During the course of its 84-year orbit around the sun, Uranus points first one pole toward the sun, then its equator, and then the other pole. It is thought that a catastrophic collision between Uranus and another body, perhaps a large comet, may have knocked the planet on its side. 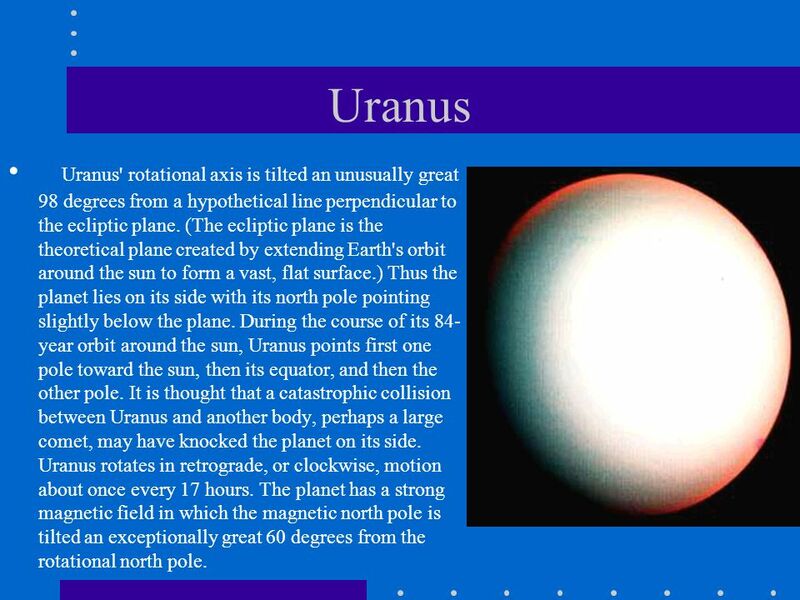 Uranus rotates in retrograde, or clockwise, motion about once every 17 hours. The planet has a strong magnetic field in which the magnetic north pole is tilted an exceptionally great 60 degrees from the rotational north pole. 15 Neptune Like the other gaseous planets, Neptune rotates rapidly, once every 16.1 hours, and has a slightly larger diameter at the equator than at the poles. The atmospheric temperature has been found to be at about 60 K, higher than expected for a body so far from the sun. Its high temperature suggests that Neptune has another, possibly internal, heat source. The planet probably has a rocky core surrounded by water ice and liquid methane, which in turn are surrounded by hydrogen and helium gases. 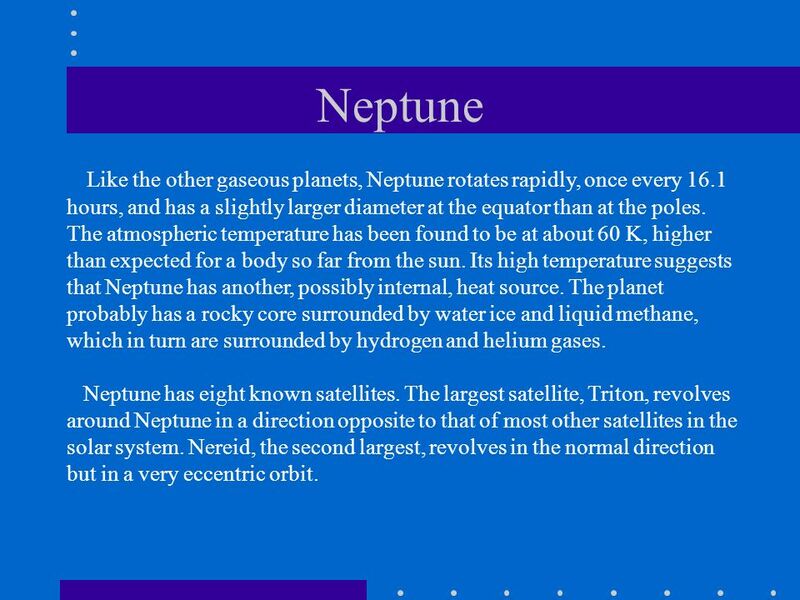 Neptune has eight known satellites. The largest satellite, Triton, revolves around Neptune in a direction opposite to that of most other satellites in the solar system. Nereid, the second largest, revolves in the normal direction but in a very eccentric orbit. 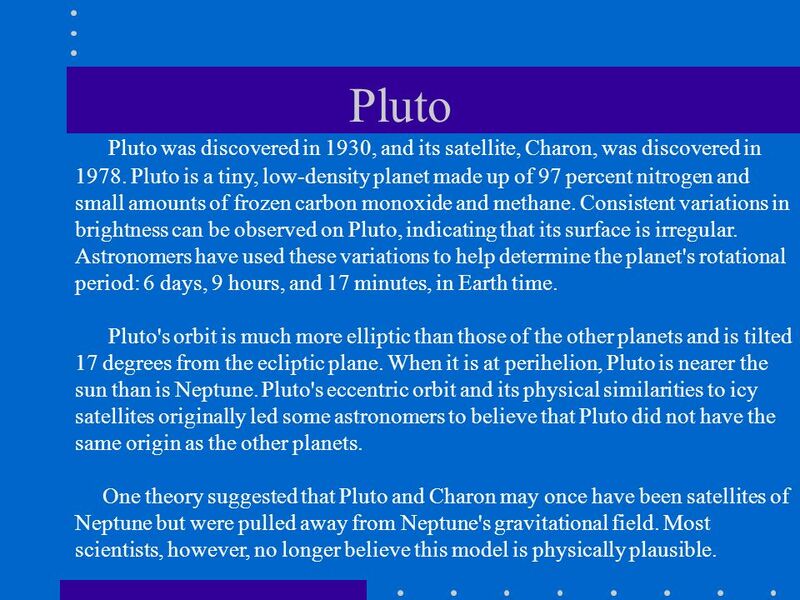 17 Pluto Pluto was discovered in 1930, and its satellite, Charon, was discovered in Pluto is a tiny, low-density planet made up of 97 percent nitrogen and small amounts of frozen carbon monoxide and methane. Consistent variations in brightness can be observed on Pluto, indicating that its surface is irregular. Astronomers have used these variations to help determine the planet's rotational period: 6 days, 9 hours, and 17 minutes, in Earth time. 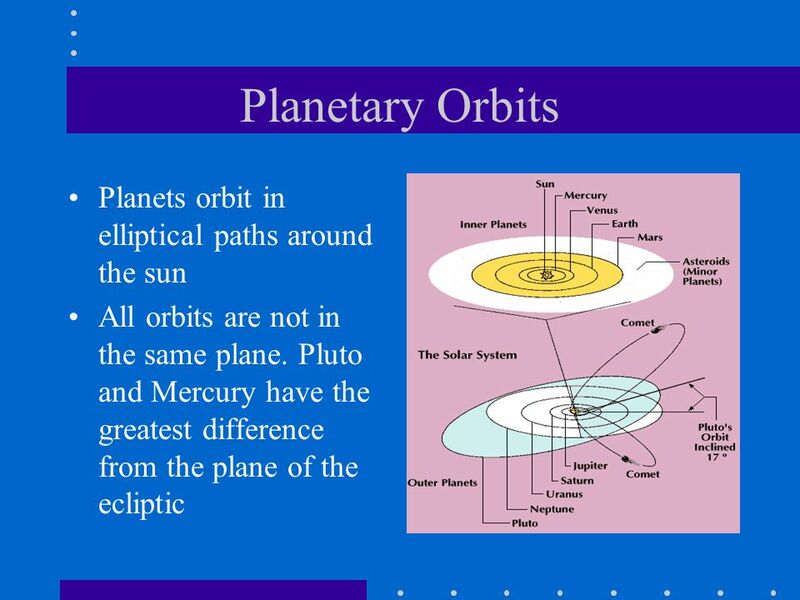 Pluto's orbit is much more elliptic than those of the other planets and is tilted 17 degrees from the ecliptic plane. 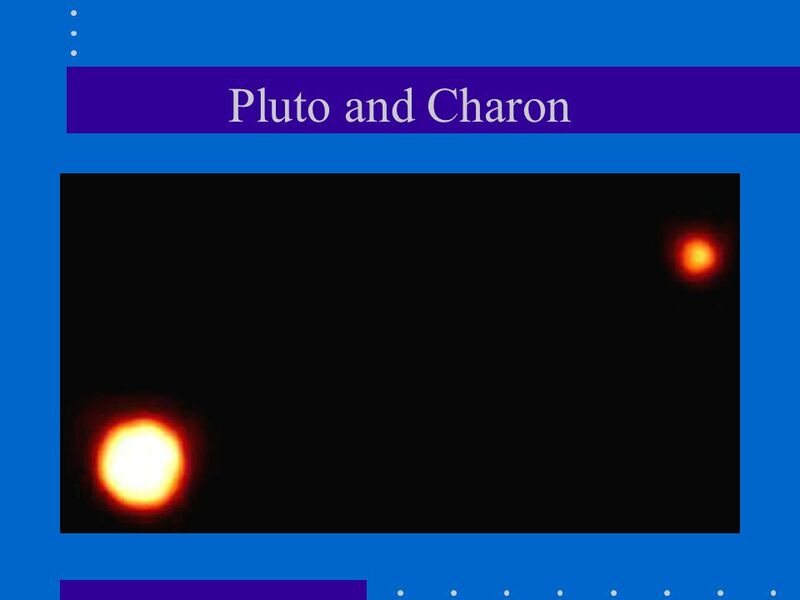 When it is at perihelion, Pluto is nearer the sun than is Neptune. Pluto's eccentric orbit and its physical similarities to icy satellites originally led some astronomers to believe that Pluto did not have the same origin as the other planets. One theory suggested that Pluto and Charon may once have been satellites of Neptune but were pulled away from Neptune's gravitational field. Most scientists, however, no longer believe this model is physically plausible. The Path of Mars through the sky over 8 months. 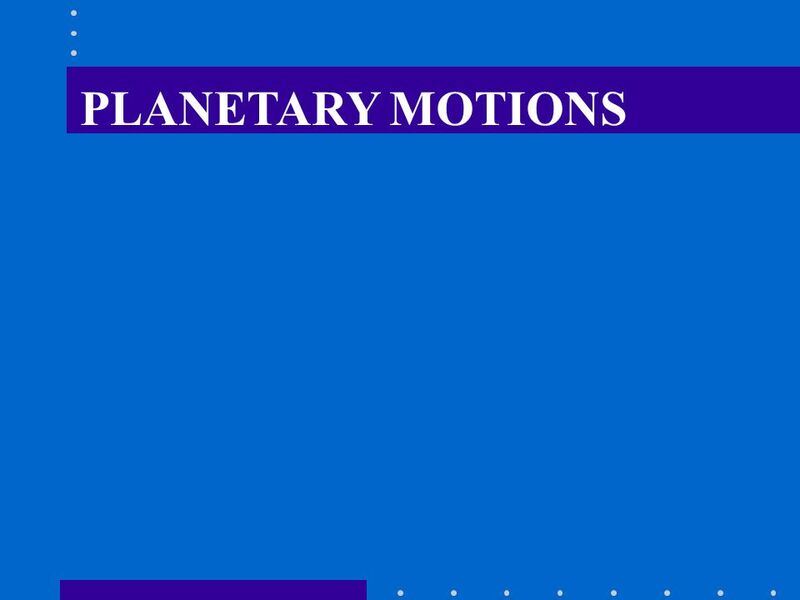 The motions of the planets as observed from Earth, called their apparent motions, are complicated by Earth's own revolution, rotation, and slightly tilted axis. The Earth rotates from west to east, so that both the stars and the planets appear to rise in the east each morning and set in the west each night. Observations made at the same time every night will show that a planet usually appears in the sky slightly to the east of its position the previous night. Periodically, however, a planet will appear to change direction for several nights and move slightly to the west of its previous position. 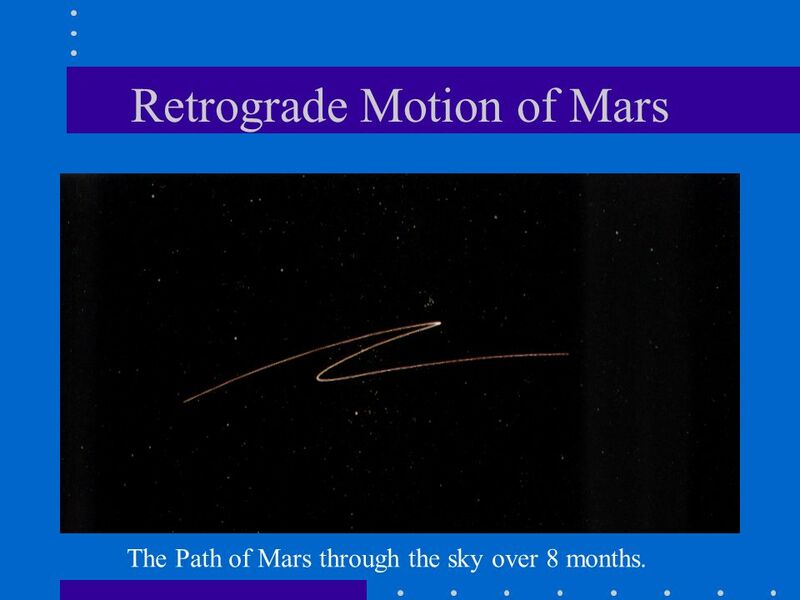 When a body moves opposite to an established direction, its movement is known as retrograde motion. 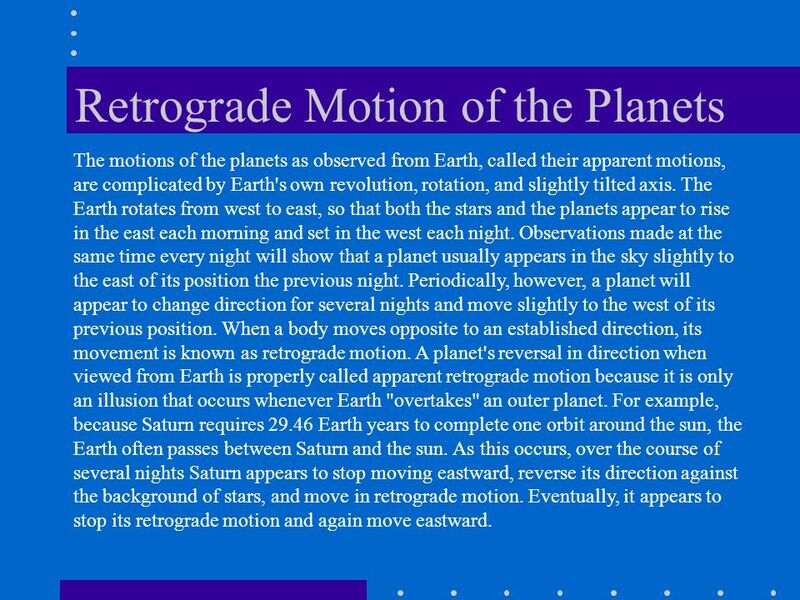 A planet's reversal in direction when viewed from Earth is properly called apparent retrograde motion because it is only an illusion that occurs whenever Earth "overtakes" an outer planet. For example, because Saturn requires Earth years to complete one orbit around the sun, the Earth often passes between Saturn and the sun. As this occurs, over the course of several nights Saturn appears to stop moving eastward, reverse its direction against the background of stars, and move in retrograde motion. Eventually, it appears to stop its retrograde motion and again move eastward. Mercury and Venus also have unique apparent motions. Both appear to move from one side of the sun to the other. 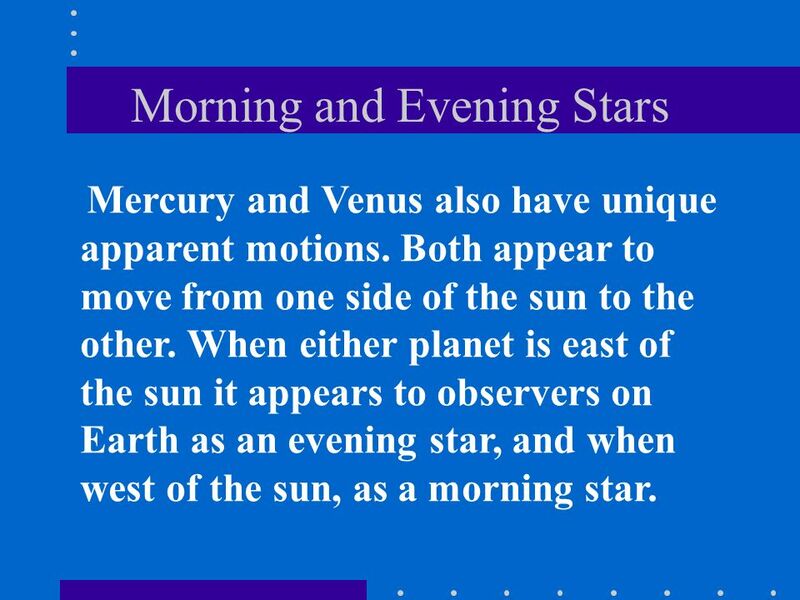 When either planet is east of the sun it appears to observers on Earth as an evening star, and when west of the sun, as a morning star. Our Solar System A Write On Activity. 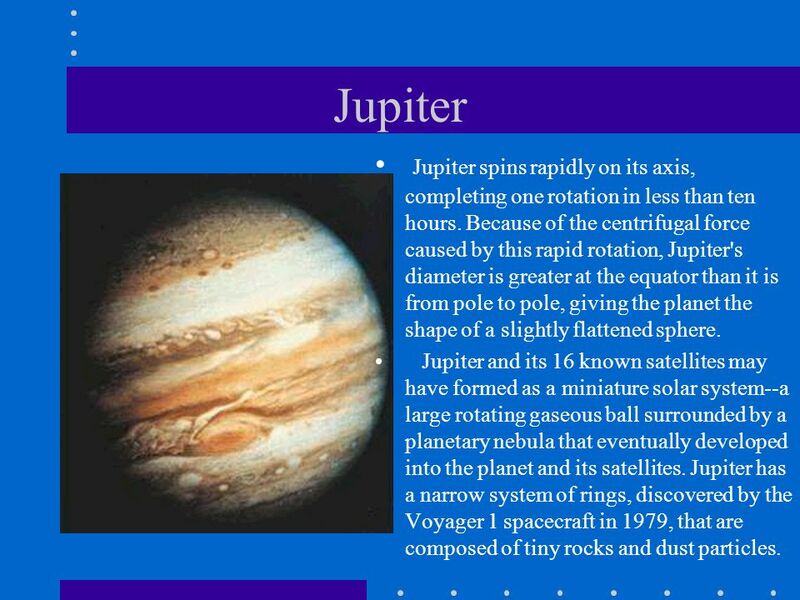 The Outer Planets Chap 16, Sec 4. Planets: Wandering Worlds Chapter 4. Planets The planets are called wondering worlds… This is because they are in motion. THE OUTER PLANETS. The Gaseous Planets- Jupiter, Saturn, Uranus, Neptune.  It is the hottest star. 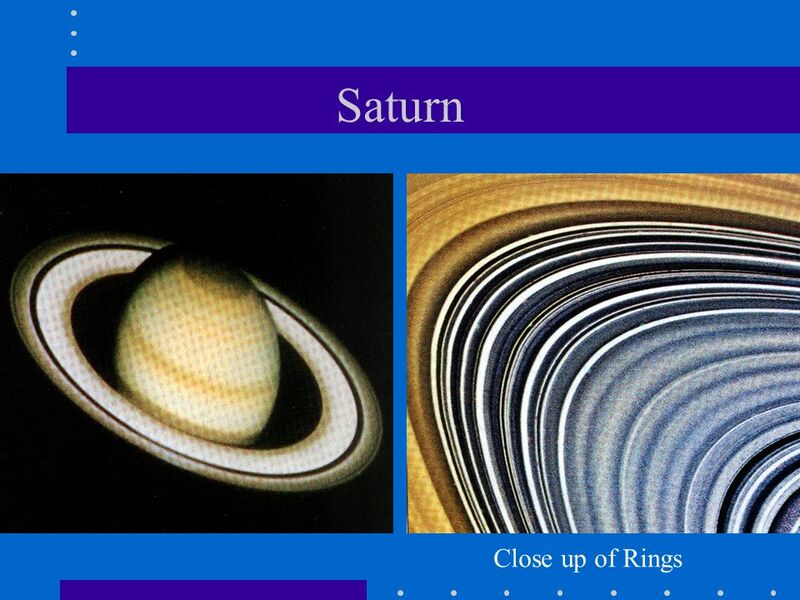 All the planets rotate around the sun. Years ago people thought that all of the planets, including the sun, revolved around. 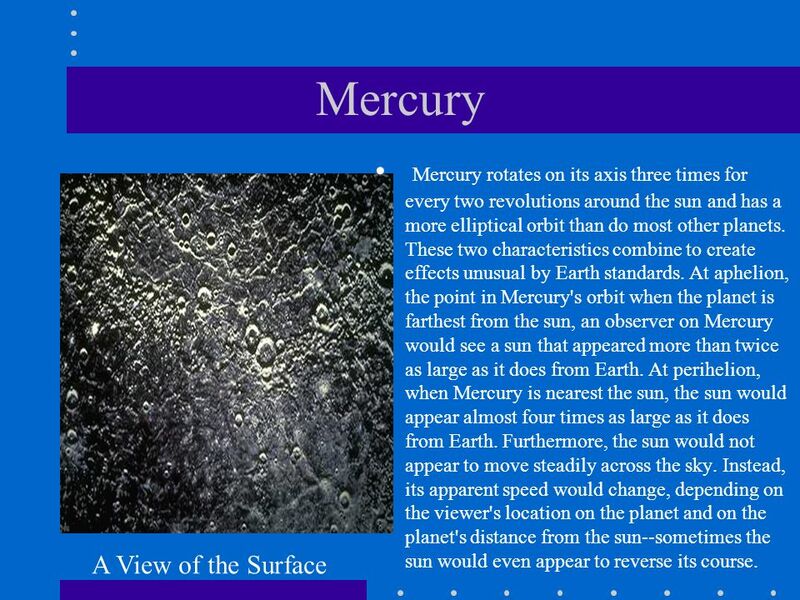 Origin of the Solar System GCSE ScienceChapter 12. 11/15/99Norm Herr (sample file) SOLAR SYSTEM The Sun Nine Planets Sixty-one satellites of the planets Many Comets and asteroids. The Moons of Our Solar System. How many moons are in our solar system? 1? 9? 61? 159? 159 and counting! Rotation=Spinning Revolution = Orbit The Inner Planets.  Satellites – natural or artificial bodies that revolve around larger bodies such as planets. Our Solar System Mrs. Lacks 6th Grade. Chapter 8, Astronomy. 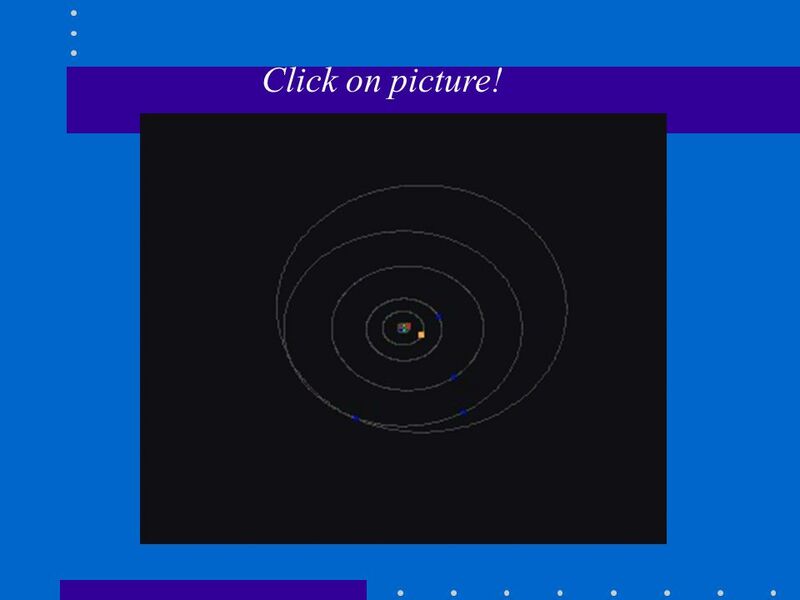 Identify planets by observing their movement against background stars. Explain that the solar system consists of many bodies held. Solar System Review Game. 1.Which planet’s day is longer than its year? 2.Which planet has two moons? What are their names? 3.Which planet has six thin.